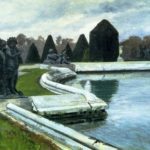 Alexander Nikolayevich Benois was born on April 25 Old Style (May 3), 1870 in St. Petersburg. His father, Prof. Nikolai Leontyevich Benois, was an academician and architect, President of the St. Petersburg Society of Architects. 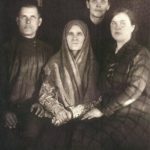 His mother, Kamilla Albertovna, was the daughter of the architect Kavos. 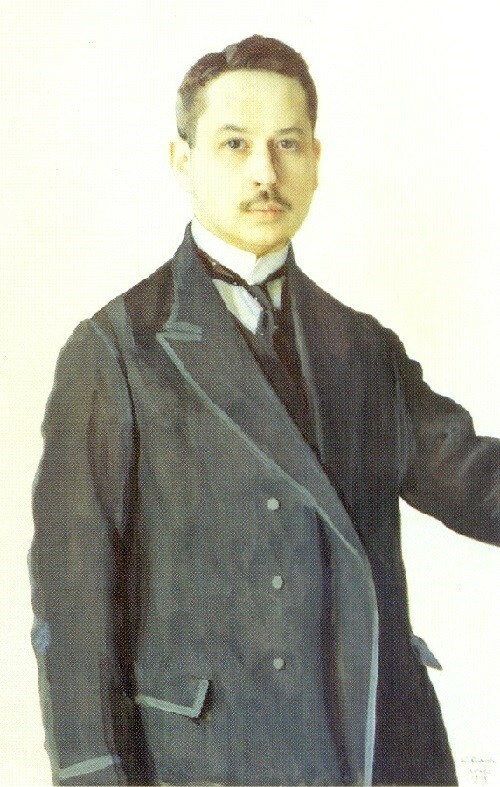 Between 1885 and 1890s, he attended Karl Mais gymnasium where he befriended his classmates Walter Nouvel, Dmitry Filosofov, and Konstantin Somov. A little later, this group was joined by Sergei Diaghilev, Leon Bakst, Alfred Nurok. 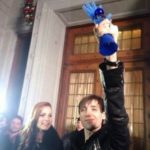 and Evgeny Lanceray. 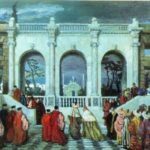 In the autumn of 1887, aspired to become a stage designer, he entered the Academy of Arts, but disillusioned, dropped out a mere four months later. Between 1890 and 1894. he studied law with Filosofov, Nouvel, and Diaghilev at the University of St. Petersburg. 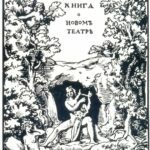 He made his debut in the realm of literature with an essay on nineteenth-century Russian painting to supplement Richard Muther’s History of Painting (his main writings are listed in the bibliographical section). In 1890. he visited Germany for the first time, then revisited it in 1894, in which year he also traveled to Switzerland and Italy. 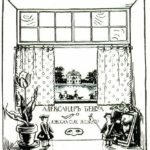 In late 1896, he went with Somov and Bakst to Paris where he stayed until the autumn of 1899. 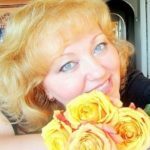 He со-drafted the program for the World of Art journal, of which he became editor and a regular contributor. He exhibited from 1892, and participated in most of the World of Art shows. 1897 The Last Walks of Louis XIV series (watercolor, gouache, charcoal, and gold paint. 1898 “The King Takes His Walk in Every Weather…” (watereolor). 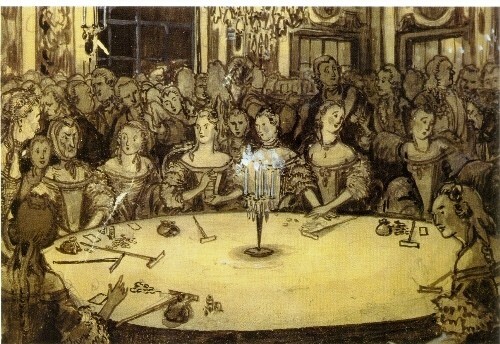 Masquerade in the Reign of Louis XIV (pastel). 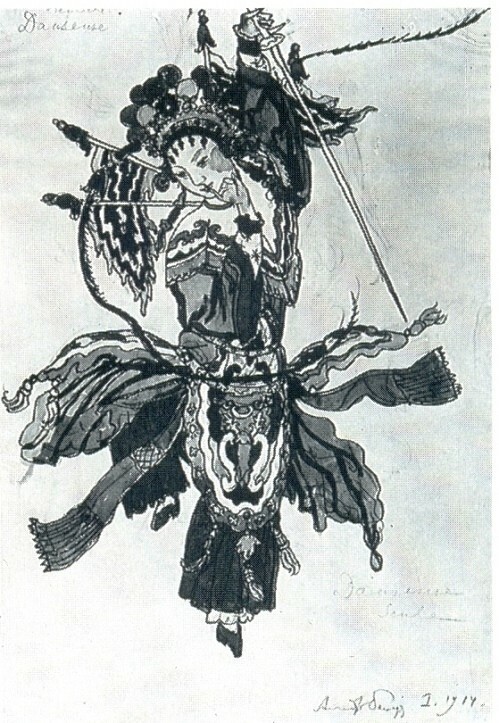 Illustrations and headpiece for Pushkin’s The Queen of Spades. 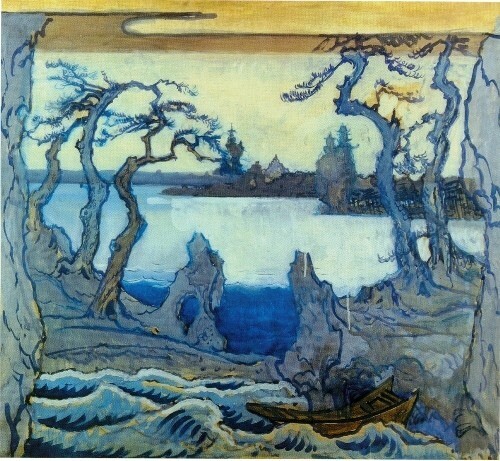 1899 The Chornaya River (three verions, watercolor). Portrait of the Artist Valentin Serov (pencil). Illustrations for Hoffmann’s Der Goldene Topf (The Golden Pot). Grand Palace (pencil). Set and costume designs for Alexander Taneyev’s Cupid’s Revenge at the Hermitage Theater, St. Petersburg, performed in 1902. 1901 Avenue in Autumn. Oranienbaum (tempera). Oranienbaum. The Monkey Cabinet in the Tobogganing Hill Pavilion (pastel). Oranienbaum. The Great Hall in the Tobogganing Hill Pavilion (pastel). Park at Oranienbaum (tempera, pastel, gouache, and pencil). 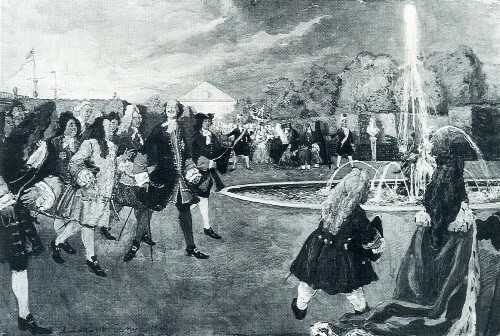 Oranienbaum (gouache). Woods: set design for an unrealized production of Scene 1 of Delibes’ Sylvia. Illustrations (in collaboration with Lanceray) for Nikolai Kutepov’s The Tsarist and Imperial Hunt in Russia. Late 17th and 18th Centuries. 1902 The Temple of Friendship in Winter. 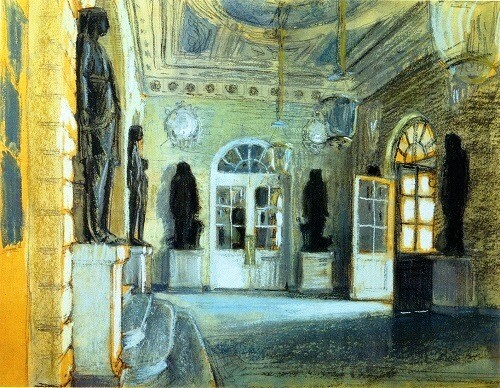 Anteroom of the Grand Palace in Pavlovsk (pastel, charcoal, and gouache). The Pavlovsk Palace (watereolor). The Grand Circles. Pavlovsk (water color and pencil). The Bip Fortress (watereolor). Peterhof in the Eighteenth Century: Half-title drawing (India ink heightened with white). The Gardens of Diana: Sketches of a panel for a dining room at the Contemporary Art Store and Exhibition in St. Petersburg (watereolor and gouache). Set and costume designs for Richard Wagner’s Gotterddm- merung at the Mariinsky Theater in St. Petersburg produced in 1903. 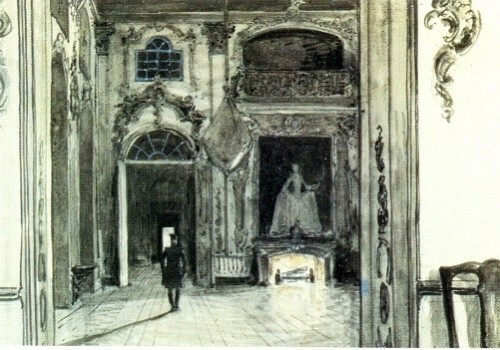 1903 Villa d’Este in Tivoli (watercolor and pencil). Evening in Rome (watercolor). St. Dominic’s Stairs (watercolor and pencil). Villa Borghese (watercolor). Villa Medicis (watercolor). Landscape at Albano (watercolor). Anzio Harbor (watercolor). The Neva Embankment by the Senate (charcoal). The Fontanka in the Days of Catherine II (watercolor). Empress Elizaveta Petrovna Taking a Walk through the Streets of St. Petersburg (watercolor). 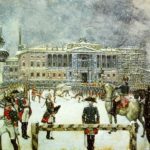 The Changing of the Guard in Front of the Winter Palace in the Reign of Paul I (watercolor). 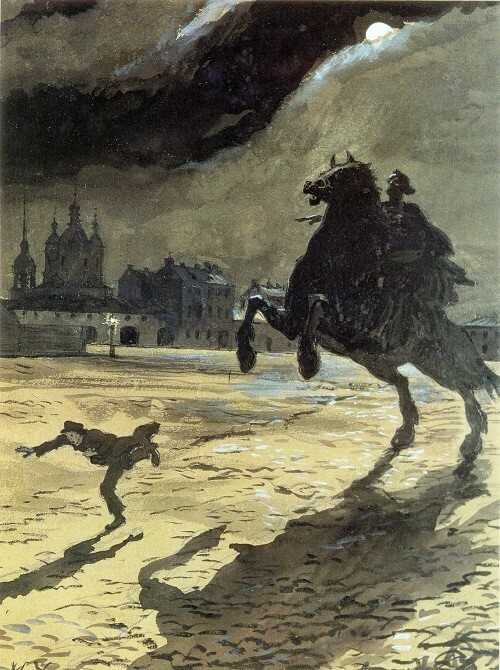 Illustrations for Pushkin’s The Bronze Horseman. 1904 Toys series of drawings (pencil and watercolor). A Nook in St. Petersburg (watercolor). 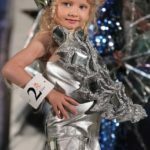 Petrouchka Street Show (pencil). Stepan Yaremich at a Recital of Modern Music (pencil). Anna Ostroumova-Lebedeva and the Artist’s Daughter in Gorki (pencil and India ink). Paris Boulevard (watercolor). 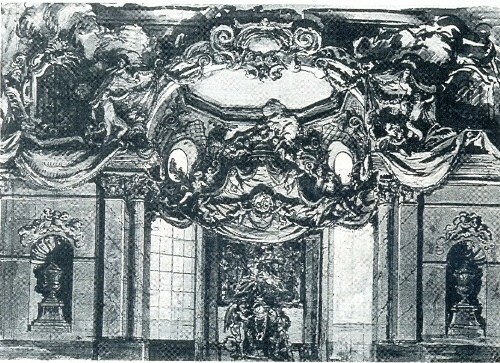 Designs for the interior decoration of the exhibition at the Tauride Palace (India ink and pencil; watercolor and pencil). Illustrations for Pushkin’s The Captain’s Daughter and Fenimore Cooper’s The Last of the Mohicans. Cover, title page, and illustrations for an ARC book. 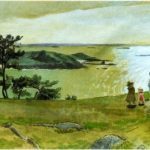 1905 Seashore: Primel. Rural Landscape: Prirnel. Versailles: The Palace. Versailles. Fountain. In the Park at Versailles. Autumn in Versailles. Cliffs (watercolor). Sunset in Primel (watercolor). 1908 Alexander I Feeding Birds in the Aviary at Tsarskoye Selo (watercolor and gouache). The Kiss (gouache). Apollo and Daphne (watercolor and pencil). Portraits of the artists Bakst, Somov, and Yaremich. the singer Sobinov, and the composer Tcherepnin (pencil). Self-Portrait (pencil). Sketches for a bust of Peter the Great and the statuary for embellishing the fayade of the Peter the Great School in St. Petersburg (watercolor). Design of a panel for the pediment of the Architectural and Industrial Fair Building in St. Petersburg (watercolor). 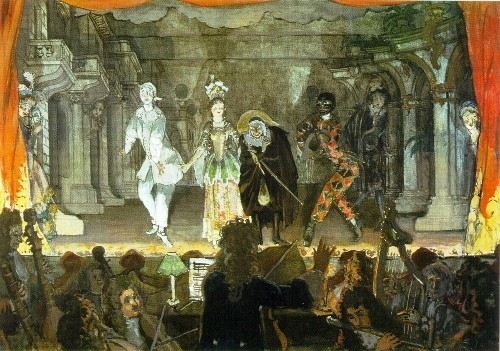 Set and costume designs for the production, by Benois and Koinissarzhevsky, of Franz Grillparzer’s Die Ahnfrau (The Ancestress) at Vera Komissarzhevs- kaya’s Theater, St. Petersburg. Illustrations for Kutepov’s The Tsarist and Imperial Hunt in Russia. Late 17th and 18th Centuries. 1909 Village Landlord (gouache). Our Dacha in Oranienbaum (watercolor). Portrait of the Artist Stepan Yaremich (red chalk). 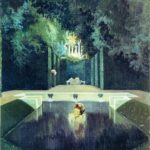 Set and costume designs for the productions by Diaghilev’s Company of Tcherepnin’s Le Pavilion d’Armide and Chopin’s Sylphides (Chopiniana). Frontispiece and illustrations for H. de Regnier’s Contes de Marquise d’Amercoeur. The Gardens at Tsarskoye Selo in the Times of Elizaveta Petrovna: headpiece for Renois’ Tsarskoye Selo. Suvorov’s Camp (gouache). A Street in St. Petersburg in the Times of Peter I (gouache). Peter I Walking in the Summer Gardens (gouache). Versailles (gouache and watercolor). Peterhof (watercolor). Winter in Finland (watercolor). Mountain Hamlet (India ink). A Venetian Garden (gouache). 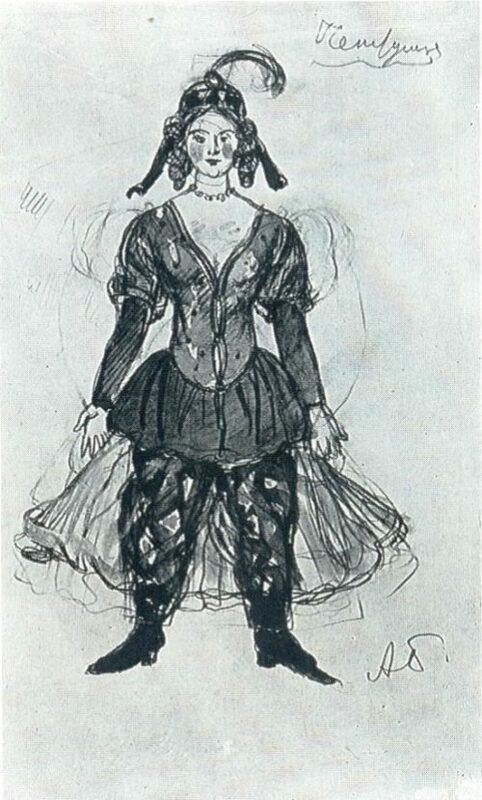 Set and costume designs for the production by Diaghilev’s Company of Adam’s Giselle. Frontispiece, half titles, illustrations, head- and tailpieces for Pushkin’s The Queen of Spades. 1911 Mountain Lake. Lugano (watercolor). Landscape near Bologna (gouache and watercolor). The Church of Santa Maria di Torello. 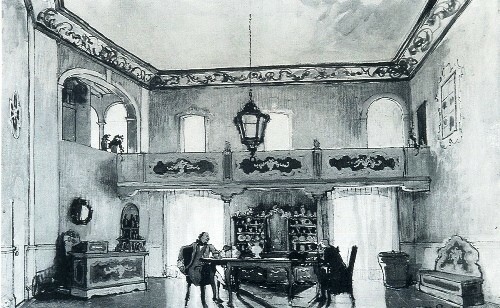 Interior (watercolor). Mountain Landscape. Monte Generoso (watercolor). A Church in the Mountains (watercolor). A Street in Montagnola (pencil). Portraits of the artists Boris Anisfeld and Mstislav Dobuzhinsky (pencil). Michel Fokine Teaching Antique Pas for the Ballet “Narcisse” (pencil). 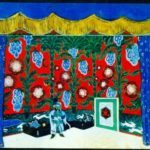 Set and costume designs for the production by Diaghilev’s Company of Igor Stravinsky’s Petrouchka. 1912 Pink Cottage in Cresogno (watercolor). Venice. The Doge’s Palace (watercolor). Canal in Venice (pencil, watercolor, and gouache). 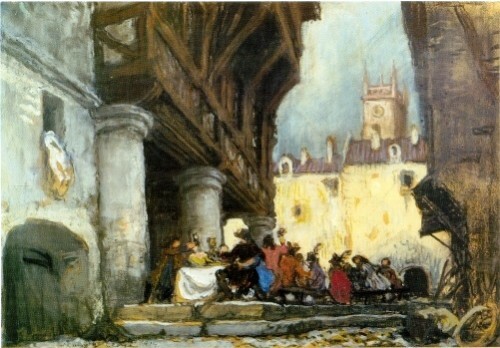 Pavilion in Vicenza (watercolor). Path in Belvedere (watercolor). Church of San Pietro in Bambio (watercolor and pencil). Mountain Lake. Lugano (watercolor). View of the Bay (watercolor). Embankment in Anzio (watercolor). Lake at the Foot of the Mountains (pencil and sepia). The Simplon Pass (gouache). Self-Portrait (watercolor and pencil heghtenend with white). Nikolai Remizov at a “Satiricon” Meeting (pencil). Portrait of the Artist Nicholas Roerich (pencil). The Artist Anna Ostroumova-Lebedeva with Benois ‘ Wife and Son (crayons). Portrait of Sergei Diaghilev (pencil). Portrait of the Actress Maria Lilina (pencil). 1914 Bay (watereolor). Falesi (watereolor). Saint- Jean-de-Luz (watereolor). Landscape with a Belltower (watereolor and India ink heightened with white). 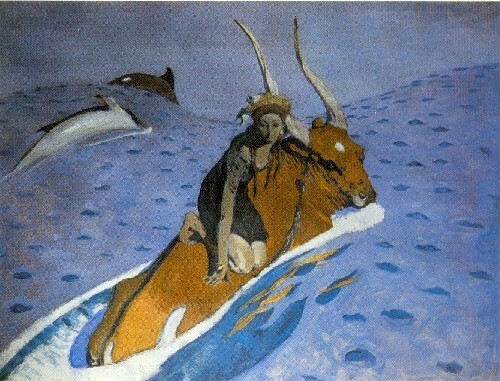 Designs for an unrealized panel at Moscow’s Kazan Bailway Station (oil, gouache, tempera, and watereolor heightened with white). 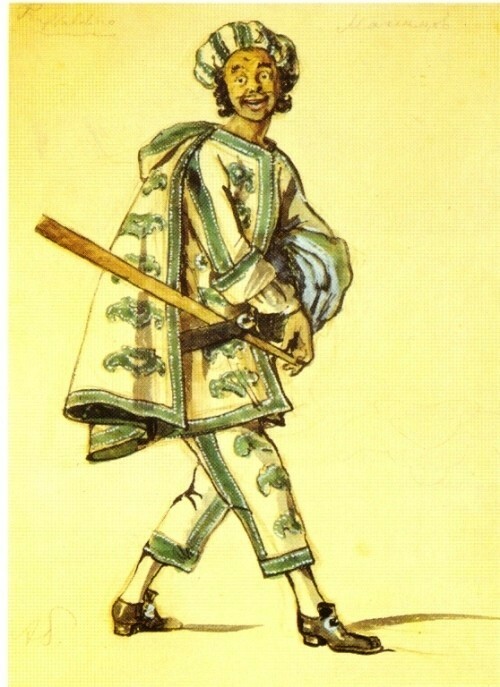 Set and costume designs for the production by Diaghilev’s Company of Stravinsky’s Le Rossignol and for the Moscow Art Theater’s Pushkin Show (1915). 1915 The Tarakhtash Valley. Soudak (watereolor). The Soudak Fort (watereolor). Terrace of the Baidake Countryhouse in Soudak. Early Morning (pastel). Novy Svet (Crimea). Bay Between Cliffs (watereolor). Self-Portrait (crayons). Portraits of the artists Stepan Yaremich, Anna Ostroumova-Lebedeva, Dmitry Mitrokhin, and Georgi Narbut (pencil). Portrait of Anna Benois, the Artist’s Wife (red chalk and blue pencil). 1916 Mountain Landscape (watereolor). Kapsel. Shore (watereolor). Seashore (watereolor)» Chopin’s Les Sylphides (Chopi- niana) and sets for Stravinsky’s Petrouchka at the Boyal Theater in Madrid. 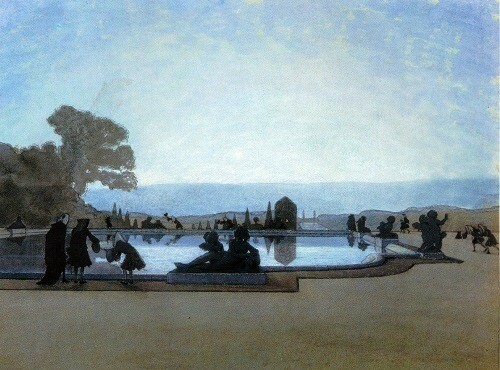 1917 Peterhof Fountains (gouache). The Village of Puzyryovo (watereolor). 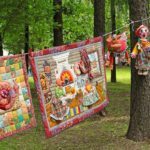 Puzyryovo. House in the Woods (watereolor). Peter I on the Shore of the Gulf of Finland (gouache). The Neptune Fountain in Peterhof (watereolor). Sergei Prokofiev at the Piano (pencil). Colophon for the Raduga (Bainbow) Publishing House. Illustrations for the fairy tale Tom Thumb. 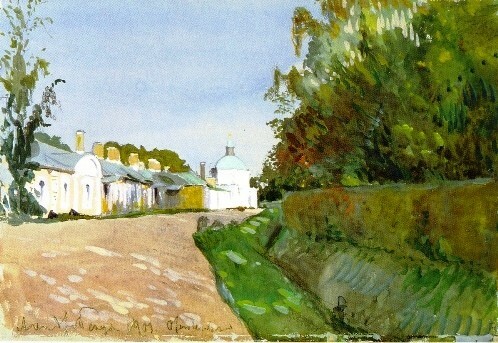 1918 Peterhof (waterecolor). The Artist’s Studio (India ink). The Grand Canal in Peterhof (pencil and India ink). Covers for The Palace Museum of Tsarskoye Selo (Part I: The Alexander Palace). 1907 production of Tcherepnin’s Le Pavilion d’Armide. Cover and illustrations for Pushkin’s The Captain’s Daughter. 1920 Oscar Waldhauer in Gatchina (pencil). The Temple of Friendship in Pavlovsk (watereolor). 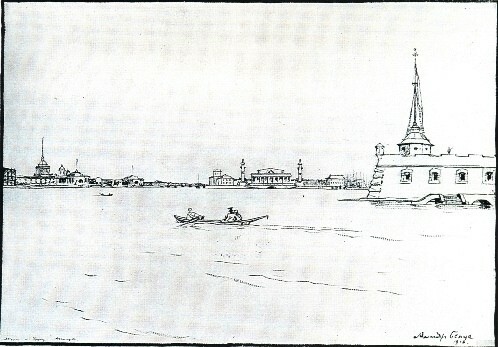 View of the Moika (watereolor and pencil). Portrait of Sergei Ernst (pencil). 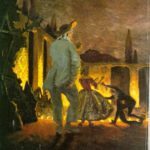 Set and costume designs for his own productions of Tchaikovsky’s The Queen of Spades at the Opera and Ballet Theater, Petrograd, and of the Moliere Show at the Bolshoi Drama Theater, Petrograd. 1922 Belltower of the St. Nicholas Cathedral (watereolor and pencil). Versailles Park (watercol- or). The Artist’s Study (watereolor).Set and prop designs for Shakespeare’s Jidius Caesar at the Bolshoi Drama Theater, Petrograd. The ornamentation and illustration of Pushkin’s The Bronze Horseman (Completion of work started in 1916). 1923 Seine Embankment (watereolor). Moika Embankment (watereolor and pencil). 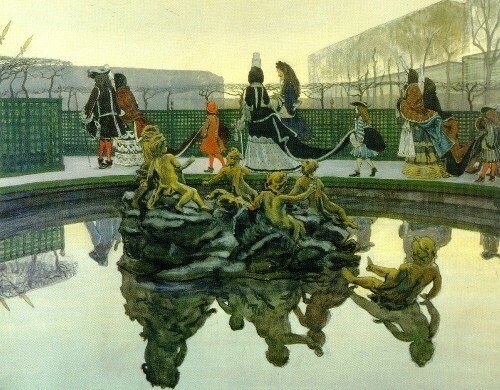 Les Tuileries (gouache and watereolor). Portraits of the artists Vladimir Tatlin and Pavel Filonov, and of the art historians Abram Efros, Oscar Waldhauer, and Igor Grabar (pencil). Set and costume designs for Henri MeUhac and L. Halevy’s Warming Pan and Moliere’s Le Bourgeois Gentilhomme at the Bolshoi Drama Theater, Petrograd, and for the Ida Bubinstein Company’s production of Alexandre Dumas’ La Dame aux camelias at the Sarah Bernhard Theatre, Paris. 1924 The Grand Palace in Peterhof (watereolor). Versailles Palace on a Winter Evening (watereolor). Houses at Versailles (watereolor). The Artists Albert Benois and Zinaida Serebryakova (pencil). Portrait of the Artist Alexander Shervashidze (pencil). 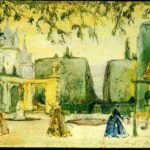 Set and costume designs for an unrealized production of Goldoni’s The Fan and Adam’s Giselle at the Paris Opera, and for the Diaghilev Company’s productions of Gounod’s Philemon and Baucis and Le Medicin malgrelui. Drama Theater in Petrograd, Tchaikovsky’s The Queen of Spades at the Opera and Ballet Theater in Petrograd, and Moliere’s Le Bourgeois Gentilhomme at the Drama Theater, Petrograd. 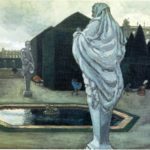 From 1918 till 1926, Benois was Keeper of the Hermitage Department of French and English Paintings. From 1926, he lived in France where he continued to work as a stage designer, painter, graphic artist, and art critic. Benois died in Paris on February 9, 1960.